There's a brand new blog in the "So a Blonde Walks Into..." series, and it is the most exciting one yet to me! Check out So a Blonde Walks Into a Wedding! Yes, that is my WEDDING blog!! I am so excited! 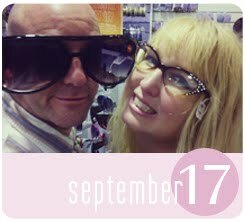 I'd be so happy if you'd sign up to follow in the sidebar and join us as we count down the days until we say, "I do!" Tomorrow is a big day for us as we meet with our wedding vendors and do tastings in the Outer Banks. Follow our Twitter accounts for live updates and pics: BlondeBlogger and Boobtubious. We'll need help choosing which foods, cake, flowers and decor we want so definitely tune in and give us your opinion!